Form: Cushion to massive-lobose, filling crevices in vertical rock faces. Appearance as of a black membrane stretched across the back of crevices. Colour: Black to dark grey-brown externally. Usually a greyish-yellow internally. Consistency: Moderately firm but compressible and spongy when in situ. Surface: Smooth but often has ridges looking like stretch-marks. The surface is usually concave. 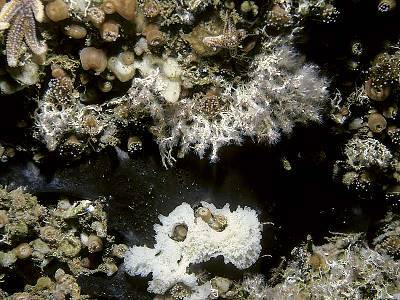 Apertures: Oscules are flush with the surface, variable in size and usually collected into groups towards the centre of the sponge. Skeleton: Main skeleton confused, of randomly arranged calthrops, with microxea and toxa near the surface. There are many pigment cells with black inclusions evident in sections. Spicules: Megascleres are large calthrops (a) with rays 250-300µm, often with axial canals seen clearly running through the rays. Microscleres are microspined or microtuberculate microxea (b) ca. 25µm and toxa (c) 55-80µm. 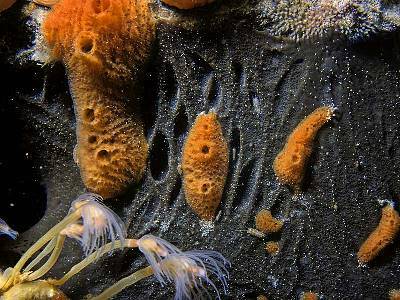 Habitat: In crevices in vertical rock faces in clean water. Particularly common on limestone substrata. "From ELWS to a few metres subtidally, in rock pools and caves." Distribution: British Isles and France. Distribution poorly known - it has not often been dredged up because of its habitat! Known recently from : west coast British Isles; common in the south west; W. Sussex. Not on east coast of UK? Identity: The black colour and the habit of bridging crevices makes it unlikely to be confused with anything else. 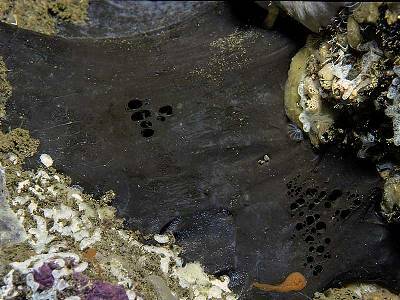 Other black sponges do exist so it is necessary to check spicule categories for a positive identification. Bowerbank's 1874 figure "is a magnificent portrait of a piece of rock from cliffs around Torbay, with small portions of sponge suspected to be present on its edges" (Burton)! Voucher: BELUM : Mc458. St John's Pt, Donegal.